It is no secret that I enjoy a good table top game and collect everything from Traditional War Games, to dungeon crawlers and even card games. The one thing that floats my proverbial boat, more than anything else in the board game world, is big, long and complex strategy games. Myself and my brother can literally spend 2 days playing games like Axis and Allies Global and still want to play more! Some cower at the thought of such a challenge but not me, the bigger the better, and I’m always on the look out for games that might provide me with that game I feel my life deserves…. and I think I’ve found it. 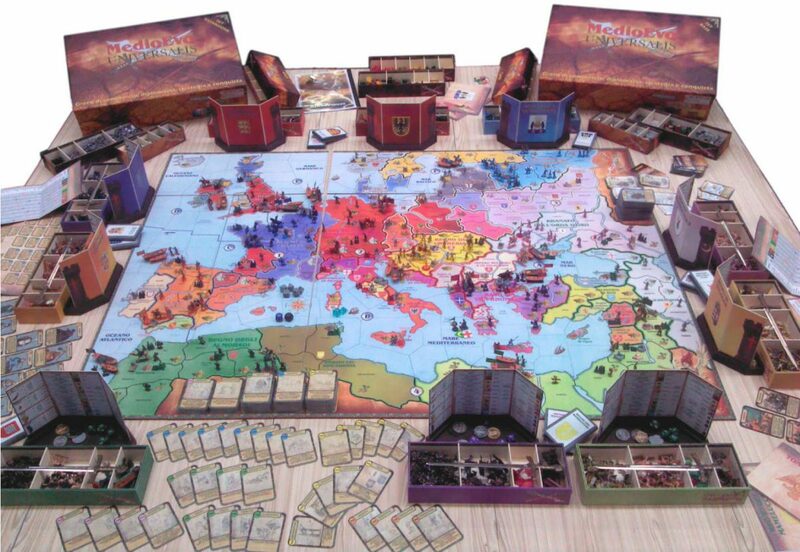 Medioevo Universalis is a game that has been in development for a long time and places you down in the tumultuous Middle Ages, as one of the main powers of the day; think Medieval total War but boardgame version of… SOLD! Players will lead one of the great medieval kingdoms of the thirteenth century by developing an intricate commercial network, advancing its technology, and weaving diplomatic relations with the other players. A number of possible adverse events can occur: natural disasters, and barbarians that will hinder military conquests or the creation of an empire. With the ability to play with up to 9 players to say this sort of game is so far up my street, it is in my house, partaking of my biscuits, is an understatement and has me salivating at its potential. With 15 days left it has smashed it original goal of 20,000 and is still going strong; meaning more stretched goals and more perdy things to add to the base game. Medioevo Universalis can be found HERE and is due for release in December.